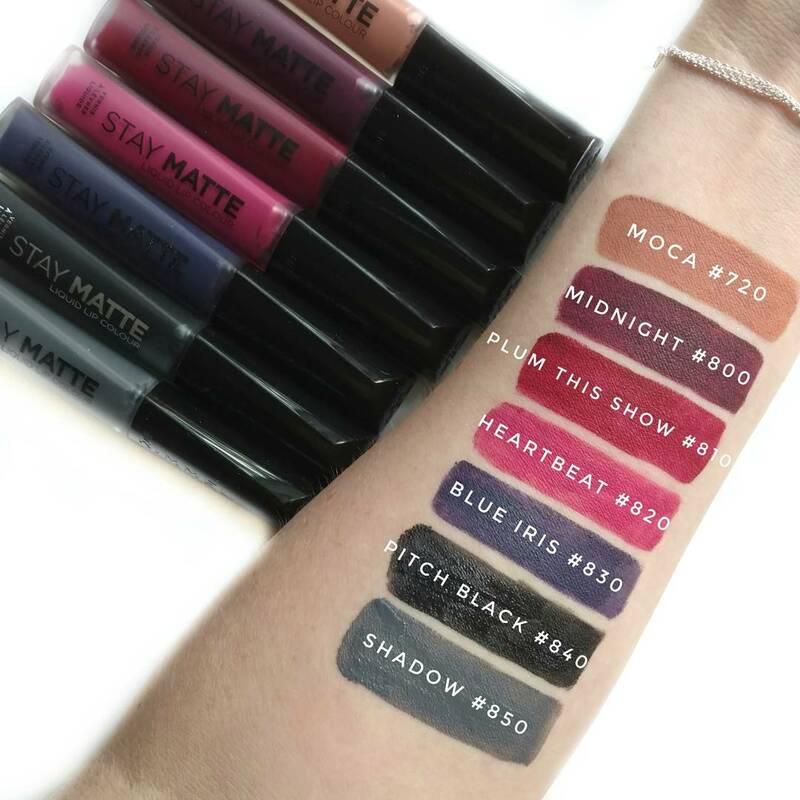 I've never been a big fan of matte liquid lipsticks but I've always held out hope that someone would invent the perfect formula...non-drying, transfer-proof, comfortable to wear, and lasts all day. So when Rimmel London sent me all 14 shades of their new Stay Matte Liquid Lip Colour, ($5.49 at Ulta), I was hopeful but not very optimistic. I've tried so many formulas and the only one that I find is comfortable to wear is the Revlon Ultra HD matte liquid lipstick. Unfortunately, they don't feel like they dry down all the way and tend to transfer on me, which is a bummer. So how did the Rimmel Stay Matte do? Keep on reading to find out (hint...they're awesome). 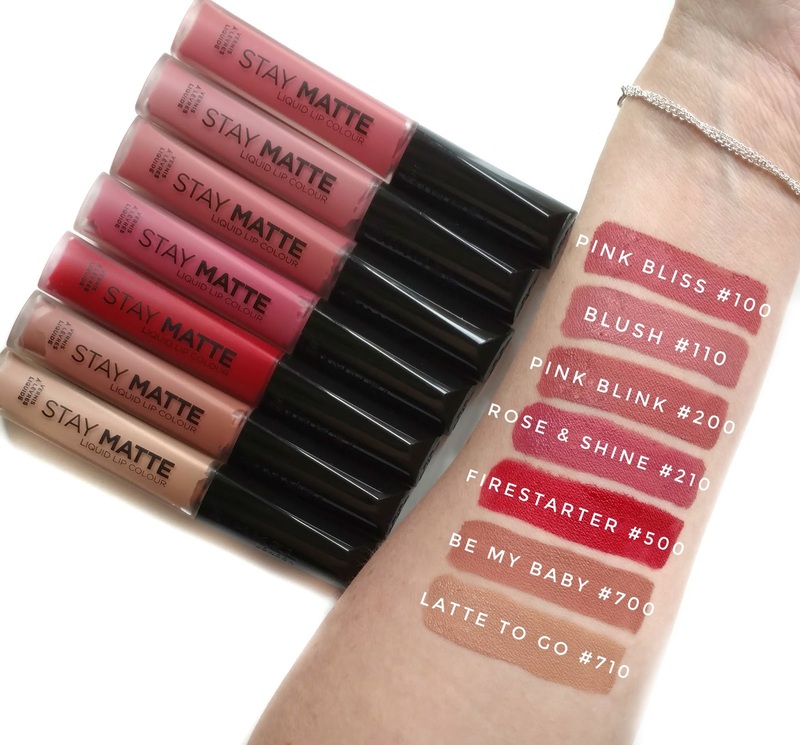 Rimmel London's Stay Matte Liquid Lip Colour delivers high intensity color with a velvety matte finish from the very first stroke! 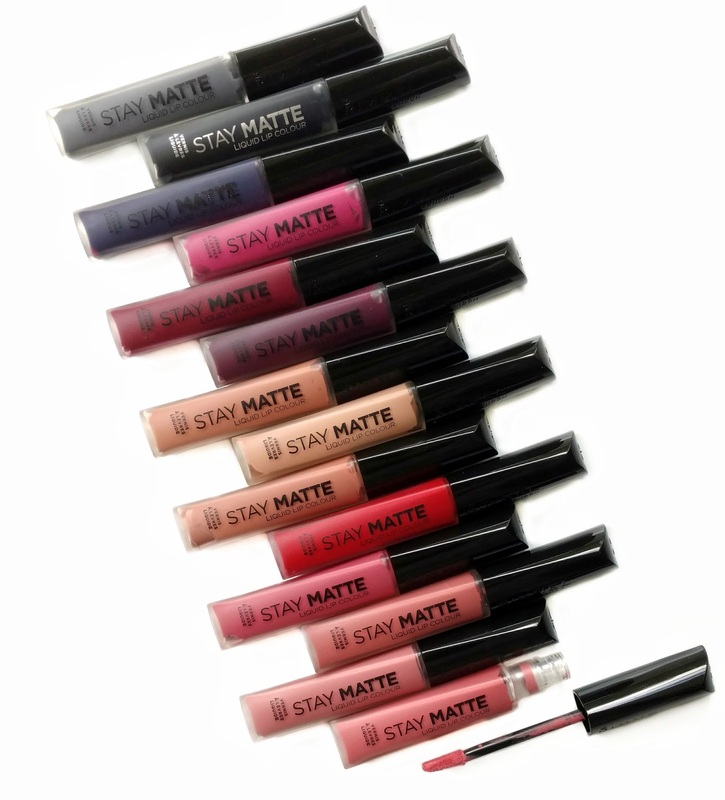 I'm happy to report that the new Rimmel Stay Mattes are that holy grail formula I've been waiting for! They have that same cushiony, gel-like feel that the Revlon ones have but they dry down completely matte within a minute of applying them. At that point, they're completely transfer-proof and stay on all day. The best part is, they aren't drying at all...they feel so comfortable I forget I'm even wearing them. When testing out a few different colors this week, there were a few times when I looked in the mirror after several hours and was startled by my reflection because I forgot I was even wearing lipstick. They also smell exactly like the Revlon ones...they have a sort of sweet, almost fruity scent but I don't smell it at all once they dry. *FYI the shade "Moca" isn't a typo, that's the way it's spelled on the tube. Also, Pitch Black and Shadow look a little shiny because they hadn't dried down yet when I took the photo. Overall, I can honestly say that the new Rimmel Stay Matte Liquid Lip Colours are a holy grail formula for me. 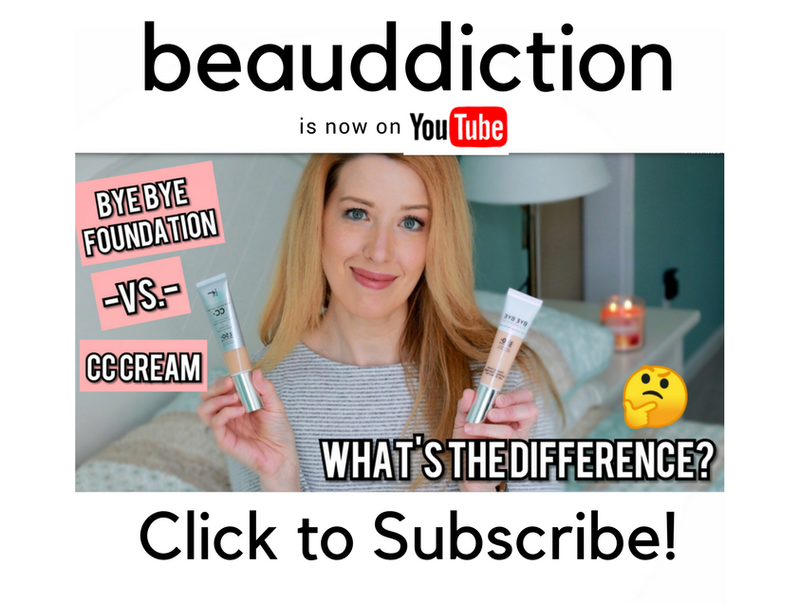 They check all the boxes when it comes to the things I want from a liquid lipstick and to be honest, I was completely shocked...especially because the price is fantastic! Grab yours now at Ulta.com (exclusively online for the next few weeks and then hopefully they'll arrive in drugstores). Have you tried these yet? Which shades are calling out to you? *Disclosure: PR Sample- Not Sponsored...All opinions are my own. Links are Affiliate Links. I'm so glad you reviewed these because I haven't seen anyone else talk about them and I want everyone to know about them! I ordered Blush, Rose & Shine, and Be My Baby from Ulta a couple weeks ago and they are just as amazing as you said they are. They last all the way thru my workday (8:30-5) and I don't notice fading until after eating dinner. They feel totally weightless and don't transfer even minutes after applying. I love, love these and hope that everyone buys them so they don't get discontinued. I hope they expand the color range! They sound amazing but I already have shades that are similar in my other lip products. I have hope these will be popular, based on your review! These look beautiful. I want all the colors on your second set of swatches even the non conventional colors. That seems like a good price at Ultra for some reason Walgreen's always makes Rimmell products $8.99 then do a buy 1 get 1 50% off. Thanks again for the preview swatches. I think I will definitely have to try these. Thanks for the great review. Picked up Pink Bliss, Firestarter, and Plum this Show at Target today. Loving them so far! Target does not have the whole range, but at $4.99, these are a steal! I have not found them at Walgreens yet.